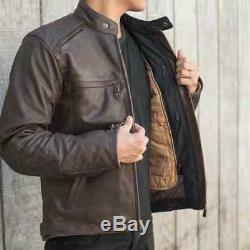 RETRO INSPIRED LEATHER JACKET WITH A SLIGHTLY DISTRESSED, BROKEN-IN FEEL. 0.91.0 mm lightly distressed brown leather. Removable CE certified Knox® protectors at elbow and shoulder and pocket for Knox ® back protector. Quilted shoulder and elbow panels. Venting at front and back shoulder and underarm. Long and short connection zippers to attach to any Triumph Jeans. 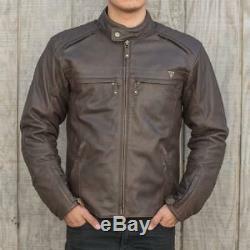 The item "Triumph Restore Brown Leather Motorcycle Jacket Small" is in sale since Wednesday, March 28, 2018. This item is in the category "Vehicle Parts & Accessories\Clothing, Helmets & Protection\Motorcycle Clothing\Jackets". The seller is "pidcock_motorcycles" and is located in Nottingham. This item can be shipped to all countries in Europe.